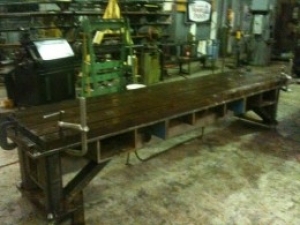 Homemade heavy-duty bending table featuring a cast iron top and attached to its 3x13' steel 'backbone' with 50 cap screws. Heavy duty indeed! Drilling and tapping for those cap screws alone must've been a lot of work.